Following the recent launch and availability of Intel's 2nd generation Core processors, Asus has now officially announced its Maximus IV Extreme motherboard based on Intel's P67 chipset. As noted, the new Maximus IV Extreme is an ATX motherboard based on Intel's P67 chipset and features support for Intel's Sandy Bridge LGA1155 processors. It has a recognizable red on black color scheme and comes packed with all the Republic of Gamers goodies like the ROG Connect, iDirect, on-board buttons, debug LED, voltage measure points and much more. Specs wise, the Maximus IV Extreme features four DDR3-2200 memory slots, four PCI-Express x16 slots, dual Gigabit Ethernet, four SATA 6.0Gbps and four SATA 3.0Gbps ports, a total of 10 USB 3.0 ports, two eSAT ports, and an integrated 7.1-channel audio. 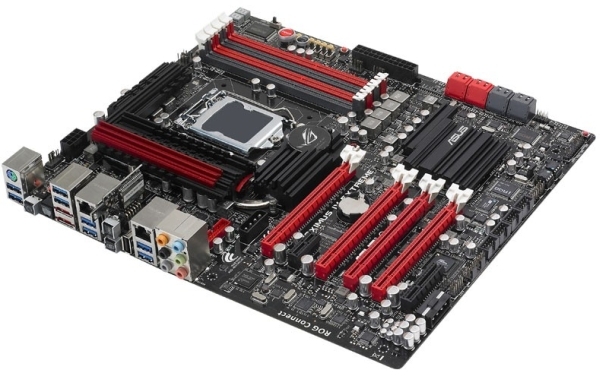 The new Maximus IV Extreme P67 motherboard is already listed all around the EU and can be found for as low as €299,73.